One of the top selling points for all three of Verizon’s big holiday devices (DROID RAZR, Galaxy Nexus and Rezound) will undoubtedly be their screens. Some have variations of the Super AMOLED display while another has a Super LCD. One is “qHD” while the others are the world’s first “HD” screens. There has been talk of PenTile and hatching and whether or not you can tell a difference between them at such high pixel densities. It can give you a headache if you dig too deeply into it, so that’s exactly what we did for you. As usual though, we like to keep it light on the science. With specs set, let’s take a look at the first macro shot of the three screens side-by-side-by-side. It’s a simple photo of website text zoomed out ever so slightly from each display. As you can see, all three of them read absolutely fine and show no distortion, pixelation or anything else that would have you complaining. Now, if you click on the image to get the full version, you will get the full effect with the PenTile hatching on the RAZR and Nexus. Does it matter all that much? To me, with these phones, no. The pixel densities are high enough that your naked eye will never be able to tell, as was the point of the picture below. And just for fun, we took one more under a different lighting scenario so that you can really see the differences between the display panels. 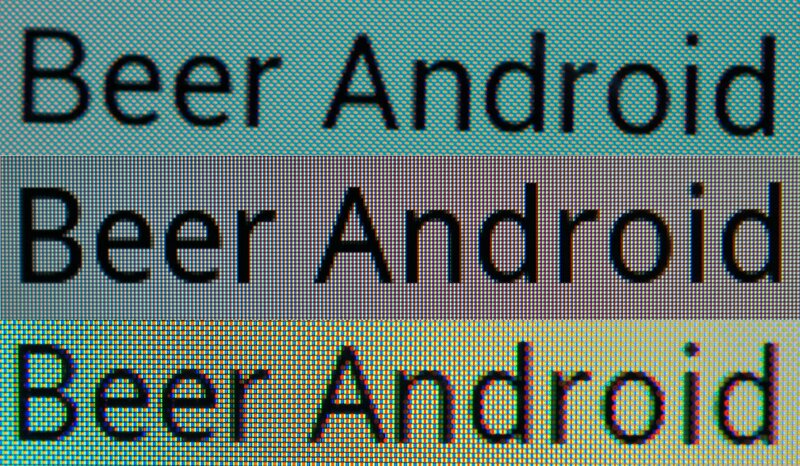 You can see how hard the Super AMOLEDs are working because they have to share pixels, while the Super LCD on the Rezound does not. Again though, the picture above which is a slight macro shot of the screens producing black text on a white website is the more realistic situation and they all look stellar (to me anyway). The shot below is really just to show you the differences between the screen technology. Up next, we wanted to take all three devices into a real word situation that many of you care about: streaming video. In this demo, you will get a sense of how video looks depending on the resolution, how Super AMOLEDs differ from Super LCDs when producing color, and the different viewing experiences. It’s not scientific by any means, but you should be able to tell a difference between the three. So if there is a conclusion to come to out of all of this nonsense, it’s that each display is pretty damn good. 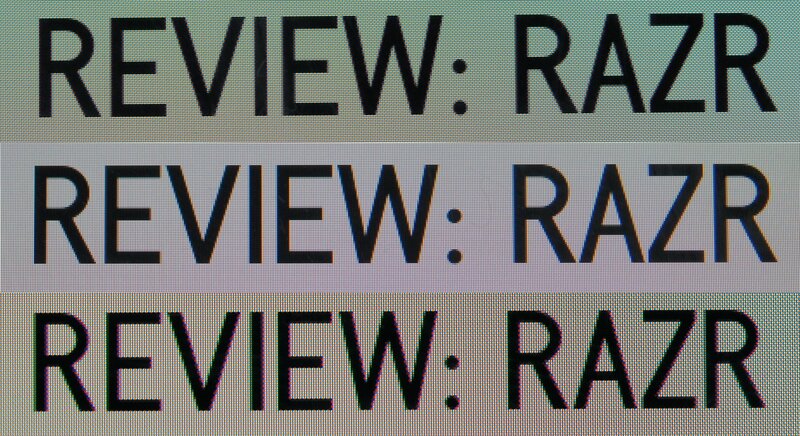 The Rezound’s display may be the most clear up close, behind a macro lens, but when compared to that of the Galaxy Nexus, your blind eye probably won’t be able to tell a difference. At 342 and 316ppi, both screens will blow your mind. 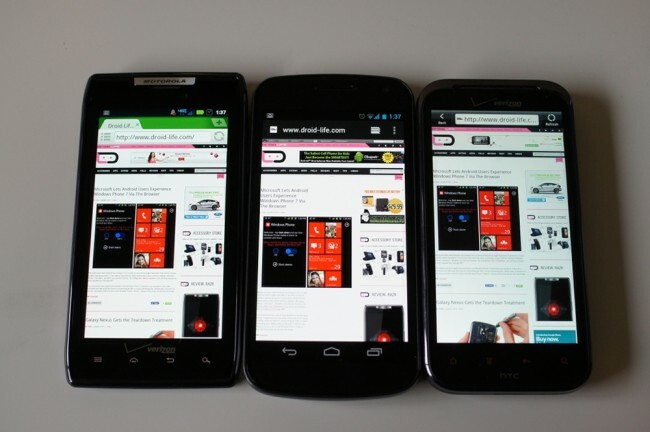 The DROID RAZR lags behind them a bit, but is a giant step forward from the screens that Motorola used on devices like the Bionic and DROID 3. Is there a winner? It all depends on what your eye prefers. As I said in the video, Super AMOLEDs tend to produce what some perceive as cartoonish or vibrant (read fake) colors, while the Super LCD on the Rezound tends to be as true and natural as you can get. As we have said for weeks now, it’s best that you spend some time with each of these devices before making a decision. Depending on your needs, I’m not sure you could go wrong with any of them.